Tasteful decorations turn a house into a welcoming home. 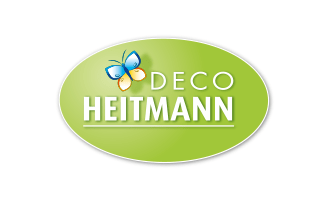 The HEITMANN DECO brand offers a wide and steadily growing selection of products for spring, Easter, and autumn as well as for the Christmas season and New Year’s Eve celebrations. When it comes to the latest trends, HEITMANN DECO always has its finger on the pulse. At retailers, these craft and decorative items are presented in displays at the point of sale, which can be set up and maintained by Brauns-Heitmann on request.